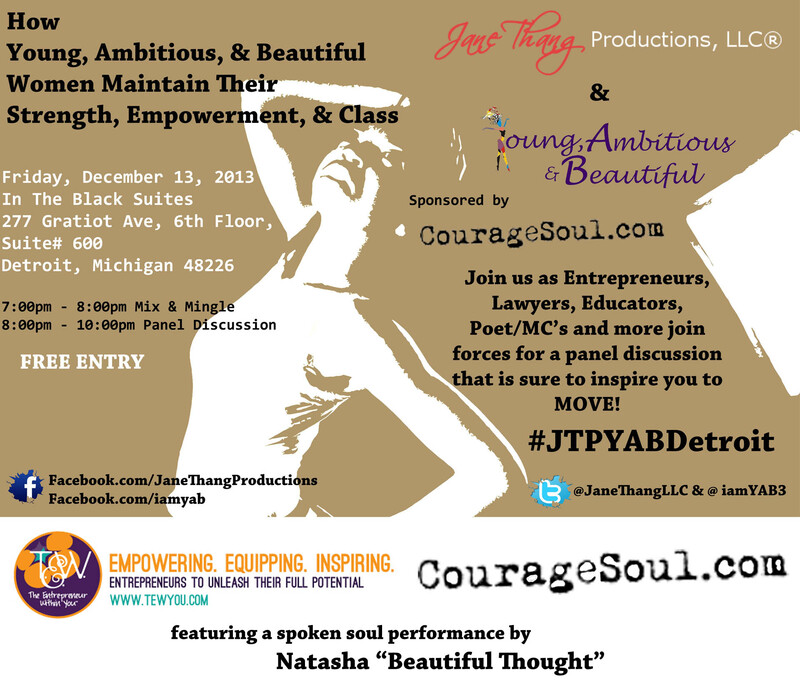 Our #JTPYAB Event Series is back again…and this time we brought it to our hometown of Detroit! On Friday, December 13th at 7:00pm, Jane Thang Productions, LLC in collaboration with our venture partner Young, Ambitious, & Beautiful will be hosting our 2nd Annual collaborative event. 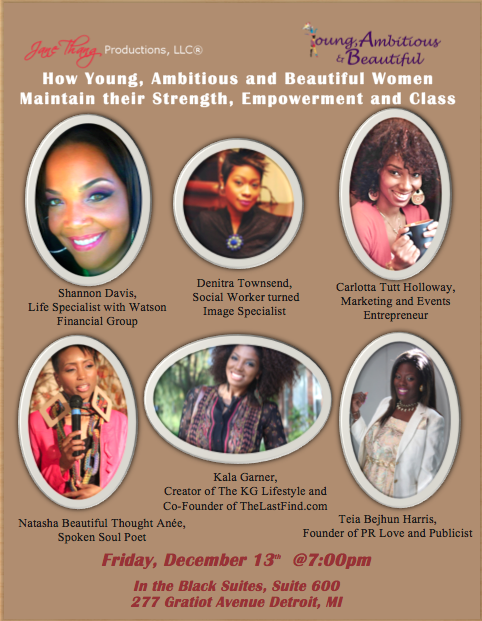 The Detroit Edition of “How Young, Ambitious and Beautiful Women Maintain Their Strength, Empowerment and Class” will be held at In The Black Suites in the heart of Downtown Detroit. In June of this year, we held this event in Chicago, at the DePaul Art Museum. It was an amazing discussion of balancing relationships, choosing your career path and being respected as a minority woman in the workplace. For our Detroit Edition, our panel, which consists of a plethora of women in different industries of entrepreneurship, will discuss life after the undergraduate experience, pursuing your passions and cultivating it into a career, and not being deterred from success as women of color. This event will feature an opportunity to discuss, network and interact intimately with women from a multitude of industries. The mix and mingle will take place from 7:00PM-8:00PM. The panel will begin promptly at 8:00PM. There will be food (specialty foods for purchase), art, a raffle and drinks!